Whilst the response from my fellow academics is usually “Excellent!”, those not so familiar with this kind of landscape research tend to ask “How?”. So, in this blog post I thought I’d explain some of the methods used to find and identify a park as medieval and then attempt to place it in its context. 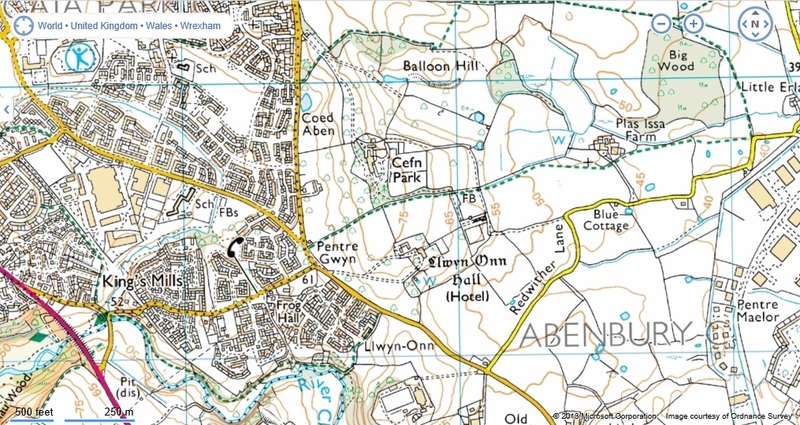 Below is an extract taken from the map of Denbighshire showing the area around Wrexham, North East Wales (Latitude 53.045083; Longitude -2.9931521). Whilst the medieval landscape of Holt has seen some academic research, the history of the park to the east of Wrexham is a little more enigmatic. The map shows that it has a very straight western boundary, and this equates to the very straight edge of the park known today as Cefn Park. The Park is now divided into two separate estates, known as Cefn Park and Llwyn Onn. The majority of the papers relating to the estates were either lost in a fire in the house of Cefn Park, and those that do survive only extend back to the Eighteenth Century. All three depictions of Cefn Park show it as an being roughly oval in shape. This is usually an indicator that a park was laid out in the medieval period, but is it possible to be more precise with a date? 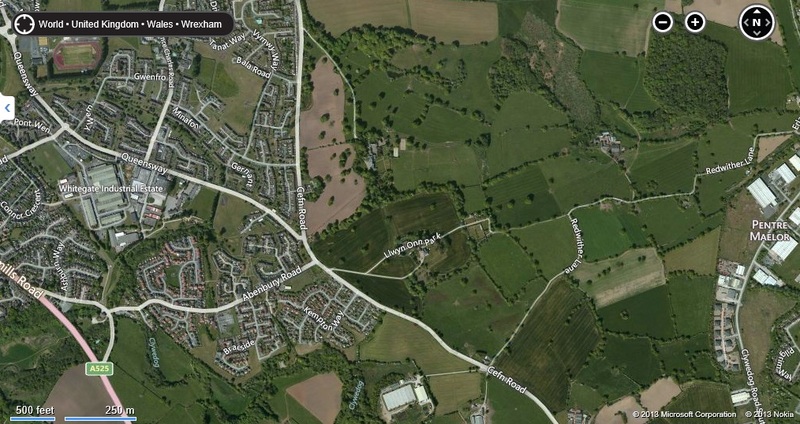 This suggests then that a new park was required by the English Lord of Bromfield and Yale at Glyn, which is close to the former motte and bailey castle of ‘Wristleham’ (Wrexham), recorded as being in existence in 1161. This, along with a new park laid out at Holt (and recorded on the John Speed map) indicates a considerable reorganisation of the landscape. The question therefore, is where is Cefn Park in the records of the period? The Extant of Bromfield and Yale, taken in 1315 for the new English Lord describing who owed what service to the him after he had replaced the Welsh Prince following the Edwardian Conquest of 1282-1283, appears to contain the answer. Cefn Park is in Abenbury, and the ‘Extent’ records that it is held by Griffi ap Ior, Griff ap Hwfa, Ienna ap Hwfa and Griff ap Ior Fychan (‘ap’ is son of, Fychan is ‘little’ or ‘junior’), except one-fifth which is held from the Queen (the wife of Edward II). These men, and their ancestors, appear to have held the land in return for carrying out services including supplying grain, gathering nuts and making and repairing some of the buildings required by the lordship administrators. 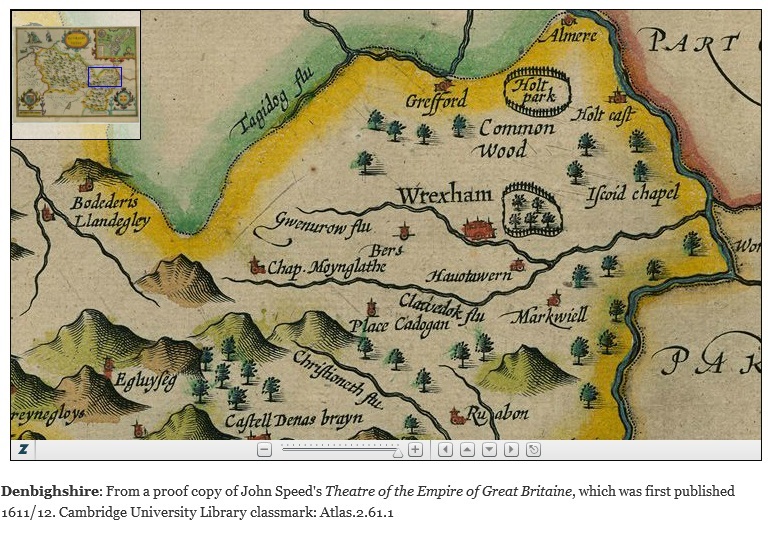 All of these services needed land, and it appear then that Cefn Park was no longer a hunting park of the Princes of Powys, but had been ‘disparked’ and put to use supplying these resources. It kept its western boundary as this was the division between it and the pasture owned by the Abbey at Valle Crucis, which they had been gifted in 1202 and the charter for which still survives. How much older than 1202 then is Cefn Park? At the moment I’ve exhausted the sources available to me, so I suspect that archaeological excavation of the park, either its boundaries or any identifiable internal features may provide the answer.